Since 2005, the U.S. government has mandated that gasoline refiners blend increasing amounts of ethanol into their fuel. In its marketing, advertising and lobbying, the corn ethanol industry has made strenuous efforts to cast corn ethanol as an environmentally friendly alternative to petroleum-based gasoline. That claim is deeply misleading. Today, 40 percent of the U.S. corn crop is being used for ethanol production, creating a dismaying array of environmental costs and unintended consequences. Corn acreage has expanded from 80 million acres at the beginning of the ethanol boom to 92 million acres as farmers tried to meet the demand and take advantage of record high corn prices. 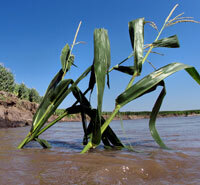 New cornfields are popping up in already water-short areas such as western Nebraska and South Dakota. Despite this, corn yields continue to lag behind industry projections, so producers have been tearing up pastures, draining wetlands, tilling grassed waterways and even converting community golf courses to corn production. In addition, farmers stopped annual rotations with wheat, soybeans and other crops, which depletes the soil. And since corn is one of the most energy-intensive crops, growers apply comparatively more chemical fertilizers and pesticides. Unfortunately, efforts to preserve precious wildlife habitat and conserve soil and water resources have been put on the back burner, leading to headline-making problems of erosion and water pollution. Government experts estimate that U.S. municipalities spend $4.8 billion per year to remove nitrates from drinking water supplies; about $1.7 billion of that spending is traceable to runoff from agricultural fertilizers. Check out EWG's Losing Ground report to learn more. The pollution doesn't end there. The environmental calculus is hardly better on the ethanol production side. Many U.S. ethanol refineries are powered by coal, hardly the most environmentally-friendly option. These facilities also emit large amounts of air pollutants that contribute to cancer, asthma and respiratory infections. By many estimates, current ethanol production systems may actually emit more greenhouse gases than gasoline. And a recent National Research Council report found that producing corn ethanol uses significantly more water than making gasoline. The environment has not been the only loser. Anti-hunger groups point out that grocery bills have risen as growers divert two out of every five bushels of corn to ethanol production. For the last 33 years, taxpayers have subsidized oil and gas companies to blend ethanol with gasoline to the tune of as much as $6 billion a year. Don't buy the industry's self-serving pronouncements. Corn ethanol is not an environmentally positive solution to our energy independence needs.